Grétry was from the Prince-Bishopric of Liège, in other words today’s Belgium. From 1767 he worked in Paris, specializing in opéra-comique. He wrote more than fifty operas and was regarded as the most important opera composer in France, possibly in competition with Philidor. His best known work is Richard Coeur-de-lion, composed in 1784, the same year as L’épreuve villageoise. He also wrote a Guillaume Tell, almost forty years before Rossini. 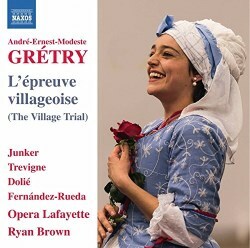 L’épreuve villageoise was one of Grétry’s most popular and long-lived operas, which stayed in the repertoire in Paris for more than a century and was played in the rest of Europe as well as in the New World. The story: Denise, a farmer’s daughter, complains that her fiancé André is so jealous and reveals to her mother the reason: Monsieur de la France has also been wooing her. Her mother, Madame Hubert is annoyed, since La France had been courting her too not long ago. During the course of the opera it becomes obvious that La France is a notorious skirt-chaser. André after some time gives up on Denise, because he has found a new love. La France triumphs and gathers all the people to witness his formal proposal to Denise, but in the meantime Denise has found out that André only loves her. When La France comes she turns him down and explains that André is her choice. La France runs off, furious, while all the people rejoice in the love between Denise and André and look forward to a happy marriage. To this libretto Grétry created some really lovely music – an overture, an entr’acte that is a one-minute-long accelerando, some arias (Denise is allotted three and J’commence à voir que dans la vie (tr. 5) is a really memorable one), three duets, a trio and two fairly long finales with all the soloists and the chorus. After the last finale there are three short ballet numbers. The music is recorded complete, as far as I understand, but the spoken dialogue is omitted. In the libretto with English translation both the sung and the spoken texts are included – for those who want to know exactly what happens. The detailed synopsis with cue numbers is however sufficient to follow proceedings. The Opera Lafayette chorus and orchestra are by now well-known quantities in the field of eighteenth century opera recordings and the four soloists are very good. It is indeed fascinating to discover that there are still previous unrecorded operas that are resurrected and turn out to be well worth hearing. We have to be grateful to Ryan Brown and his enthusiastic co-workers for their valuable research and realisation efforts. There are obviously new finds to be made and L’épreuve villageoise is wholly delightful.